In the 14 months since Donald Trump was sworn into office, a fear has been steadily growing across the country that this administration is marching the country back to a period in our history that most see as shameful growing pains on a journey towards 21st Century enlightenment. Whether it’s how this White House publicly supports white supremacists, attacks religious and racial minorities and transgender people or rolled back federal civil rights enforcement, among other disappointing actions, Trump seems intent to rewind the clock. There’s no other policy area where that assumption is truer than with the border wall. Politicians can say it’s about border security but everyone knows it has less to do with security than keeping Latin American and Mexican refugees out of the country. But as history repeatedly shows, when people are in fear of their lives, their livelihoods or the future for themselves and their children, they’ll scale any challenges to make it to safety and a place filled with hope. The Trump Administration will soon find that out when over 1,300 Latin American refugees arrive at the San Diego-Mexico border in April. 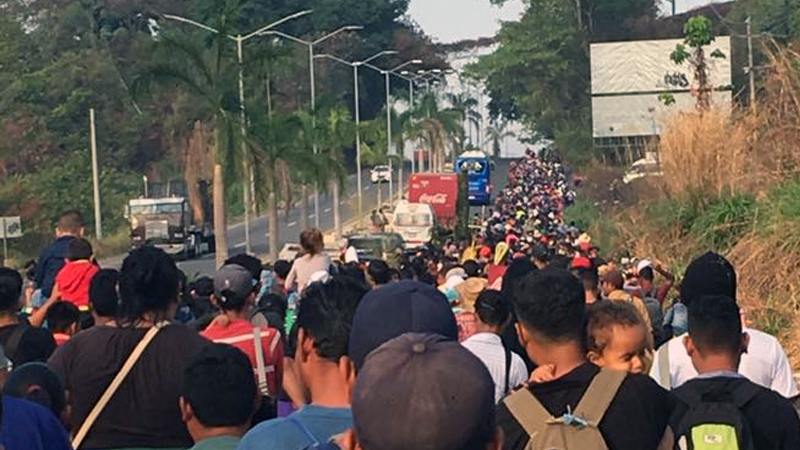 Organized by the immigrant advocate group Pueblos Sin Fronteras (Towns Without Borders), the march, known as the Refugee Caravan, is making its way through Mexico, having started in the city of Tapachula in the state of Chiapas on the Mexico-Guatemala border. Though the advocacy group has held migrant marches in the past, this one has taken a life of its own. It grew so rapidly that organizers are saying that Mexican officials abandoned a checkpoint along the marchers’ route. It’s reported that the majority of refugees are from Honduras, fleeing their country due to political unrest. Regardless of their origin, migrants in the Refugee Caravan plan to challenge Trump’s stricter vetting of children and women migrants seeking asylum. The march, according to organizers, symbolizes human dignity and the right to asylum. With migration becoming more common as climate change, violence, politics, war and suffering economies drive people to search for a better life outside their home country or continent, it’s evident that the Trump administration will have an increasingly hard time of keeping people from coming to the United States — or turning back a clock that is only counting down the hours for a future where borders themselves are history. An estimated 258 million people living in a country other than their country of birth — an increase of 49% since 2000. Previous Post Should states have their own foreign policy?